Improved Nature is a plant-based food technology company operating out of Garner, North Carolina that was founded in 2015 by Richard Hawkins, Steve Klawiter, Larry Chandler, Moshe Meidan and Sarid Shefet. Improved Nature is a food technology company making a non-GMO soy-based protein powder that can be used to make plant-based meat alternatives. Improved Nature was founded by Richard Hawkins, Steve Klawiter, Larry Chandler, Moshe Meidan and Sarid Shefet in 2015 and is located in Garner, North Carolina. ﻿PrimeProTex is a non-GMO soy based protein powder concentrate that has little flavor and can be made into a variety of meat-like textures and flavors. PrimeProTex can be made into plant-based meat alternatives mixing 10 parts water with one part PrimeProTex and boiling in water for 5-15 minutes depending on what final product is desired. After boiling, the remaining contents is drained and slightly pressed to remove excess liquid. 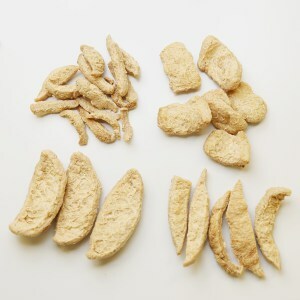 After draining, the rehydrated PrimeProTex mix can be pressed into shapes, spices, marinated, and/or mixed with sauce.